The PC market has stabilized a bit lately but that hasn’t done much for AMD, whose PC processor shipments are in decline. The company hopes to recover momentum this year with a new laptop chip coming soon code-named Carrizo. AMD will provide technical details about Carrizo at an IEEE chip conference in San Francisco Monday. Here’s some information we gleaned from them beforehand. 1) AMD will launch Carrizo in the second quarter, so laptops with the chip should come out soon after that. They’ll appear initially in lower-end and mainstream systems, which should get a bit thinner and lighter as a result. AMD didn’t give expected prices, but the laptops will likely be a bit cheaper than Intel-based systems with comparable chips. 2) AMD says Carrizo will offer unprecedented gains in power efficiency, in part thanks to fine-grained power management between the chip’s CPU and GPU. It has also added technology that can adjust the voltage up or down more efficiently as needed, with less power wasted in the process. The efficiency gains will be most apparent for basic tasks and less apparent when playing games or watching video. It didn’t give specific battery life projections; we’ll have to wait for launch time to get those. 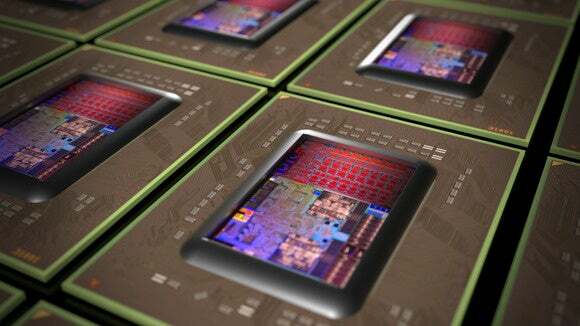 3) The chip should provide a significant boost in graphics performance, long one of AMD’s strengths. Laptops will play 4K video quite comfortably, though you’ll probably still want a separate graphics card for 4K gaming, which requires a lot more oomph. The integrated GPU in a top-end Carrizo chip will have eight cores that can operate simultaneously, an improvement from six on the current Kaveri generation. On-chip accelerators render 4K video using the H.265 (also called HEVC) format. 4) Gains in CPU performance will be more limited, which means you’ll notice less improvement for applications that aren’t graphics intensive. Previous new chips have seen instructions per clock cycle increase as much as 30 percent, but the CPU in Carrizo, which is code-named Excavator, will offer improvements in the single digits. AMD says it focused on power efficiency over performance: the CPU core uses 40 percent less power than its predecessor, the vendor says. Carrizo also supports the Heterogeneous System Architecture 1.0 specification, which is supposed to do a better job balancing execution between computing resources. 5) A minor but important detail is Carrizo’s support for DirectX 12, which will drive gaming on Windows 10 PCs. AMD wouldn’t provide much information about the chip beyond its architectural details, but software drivers are being developed for the new Windows OS. Microsoft uses AMD chips in the Xbox One, so software and hardware gains in that platform could find their way into AMD-powered PCs, said Jim McGregor, principal analyst at Tirias Research.